Last week, one of my all-time favourite women came to Montréal, fulfilling a long-held wish for both of us. 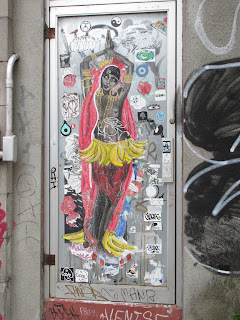 Josephine Baker wreathed in pearls (and the famous bananas) seemed an apt greeting: from one goddess to another. Sarah Canizzaro, owner of Kojima Company, has put more women in unusual pearls than anyone I know, always with heartfelt, personal attention. She crosses the world to search for them, spend time with friends made in over twenty years of pearlhunting, and find inspiration in diverse cultures. The days flew; we visited Janis Kerman's retrospective show at The Guild, where Janis met Sarah to talk about her work, and stopped by for a long look in Galerie Noel Guyomarc'h, the superb gallery of contemporary jewellery. When lights went out while we were having a nightcap, the crowd in the neighbourhood bar started singing: welcome to Montréal! 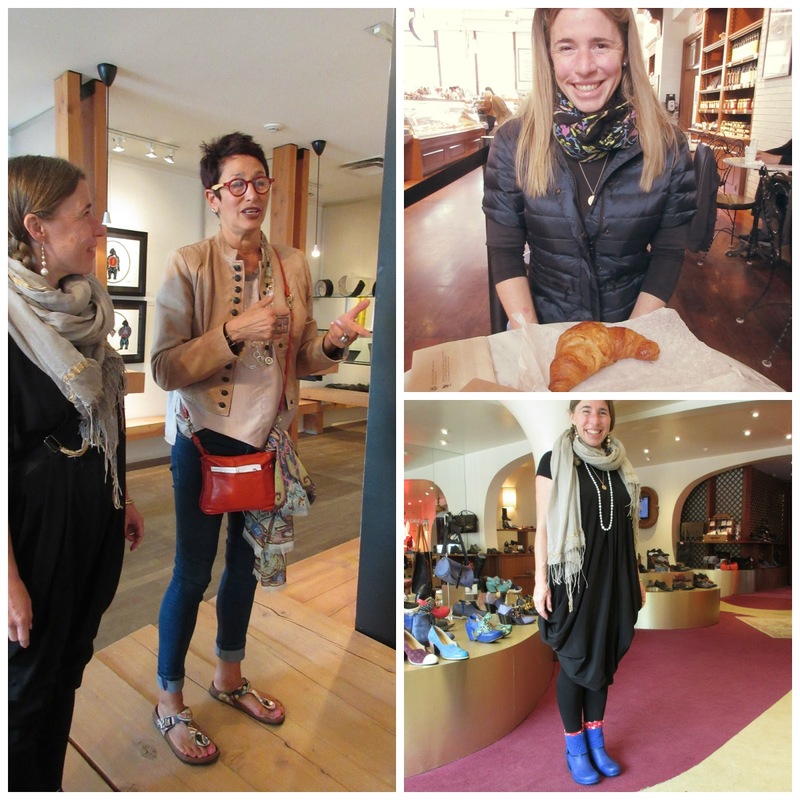 But woman cannot live by pearls alone, so there was ice cream, music, croissants, exuberant street art; bookstores, lychee sake and an irresistible pair of electric ladyland boots (Fluevog). She spent a day with a longtime friend, A., who flew in from Toronto. They met in Asia as young women with common interests: gems and travel. 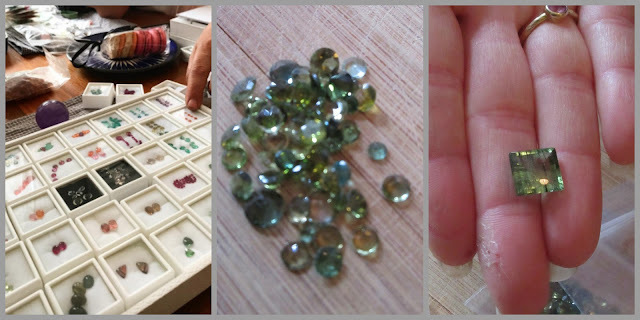 A., a collector of unusual jewels, brought boxes of delicious stones; a selection will be made into Kojima designs. She also wore a South Sea rope of silvery-white drop and drum-shapes in various sizes, cooler and looser than matchy rounds. A similar necklace is on the site; price, $1, 170. Sarah came to Montréal immediately following Kojima's spring sale, during which she and her team fulfilled a torrent of orders—a passel of women must be looking quite exuberant themselves! If you'd like to see her latest treasures, follow kojimapearl on Instagram. Oh my, what fun. I would not have guessed you two had never met, but you no doubt had so much to talk about. She looks delightful. Thank you for sharing your day with us. Such a fun visit! I'm off to check out the gallery website. Wonderful post today, even though it led me to spend an hour drooling over her Instagram and website! I love that she has beautiful pieces in such a wide price range. I'm envious of your day spent with such a creative person. Must have been a blast! Okay, I'm back. I, too, spent a lot of time on the Instagram site today. Incredible! This happens every time you post about Kojima pearls. You are MY pearl mentor and tor-mentor. 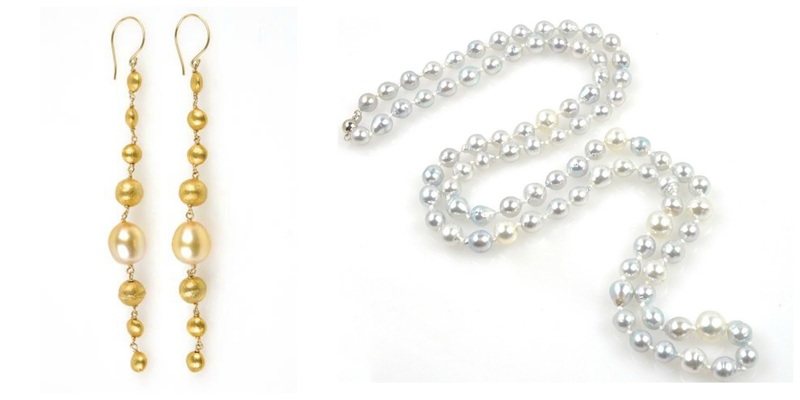 The variety of pearls astound me. The golden South Sea dangles are almost as lovely as the pair she wears in the picture. I am drawn to the casual drape of her necklace, which I would not have thought to wear, but now can't think of anything else. This always happens after the sale is over, and I live tormented until the next sale. (Not really tormented, but very, very distracted.) I am seriously considering having my 18" strand redone with chain separators, ala the "Japan Kasumi wire wrapped on Sterling". I could just send my strand to them and ask for a re-do, but after looking at the Instagram site I now want to use my airline miles and book a flight to San Rafael to peruse in person. Damn you, Duchesse.